Set up the design, look and feel of your referral screen. You can set up various design elements for your referral screen from the AppVirality dashboard like the title, description, image, color, etc. 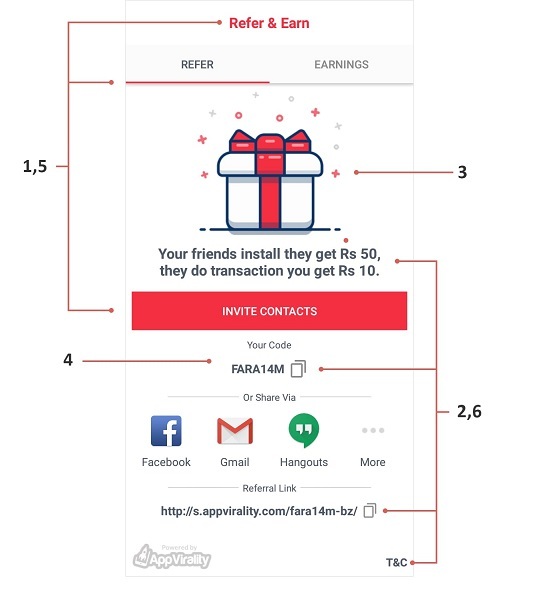 Once done same would be used inside the referral program in your app. This is the campaign title which would be displayed inside the Toolbar at the top of the Referrals screen. You can use HTML tags with it for various styling purposes like bold, break or setting some color to a part of the text. Toolbar and title would be displayed only if campaign title is set on the dashboard else it won’t be shown. <b>Some text here</b>, Used for making text appear bold. <br>, Used to give a line break in the text. <font color=color-code>Some text here</font>, Used to set color for a text, replace color-code with the hexadecimal color code you want to set. This is the campaign description which would be displayed below the campaign image on the Referrals screen. You can give some reward related description here, for ex “Your friends install they get 5$, they do transaction you get 1$”. You can use HTML tags with it for various styling purposes like bold, break or setting some color to a part of the text. In case you want to show the campaign description over the image, just upload the image with description over it and leave the Campaign Description field empty. Here you can upload an image to be used as the campaign image on Referrals screen. We set a default campaign image for every new campaign, you can either continue using the same image with your campaign or upload a new one by clicking on the “Choose File” button. In case you don’t want to use any image with the campaign just remove it using the “Remove” option. Max size of the image that can be uploaded is 250 KB. Though you can upload any resolution image as per your requirement but best would be to use 1040×910 image as it appears perfectly on large screen devices too. This is the background or base color of the Referral screen. You can either select any color from the dropdown menu or enter the color code directly. This is the color used with the Campaign Title, Selected Tab Indicator and Invite Contacts button. You can either select any color from the dropdown menu or enter the color code directly. This is the color used with the Campaign Description, Referral Code, Referral Link and T&C label. You can either select any color from the dropdown menu or enter the color code directly.